In day-to-day work, we characterise mouse strains, KO mutants or a certain protein. This report here however, is an attempt to elucidate the properties of the 2016 Cluster Science Days participants. This year, the attendees could use their breaks between fantastic talks and poster sessions to unveil some information about themselves. They could place their coloured stickers (red – University Hospital Bonn, UKB, blue – Life & Medical Sciences Institute, LIMES, green – Center of Advanced European Studies and Research, caesar, yellow – other institutes) in three different graphs and thereby let the blog know which topics they are working on and reveal a little bit about their current feelings. 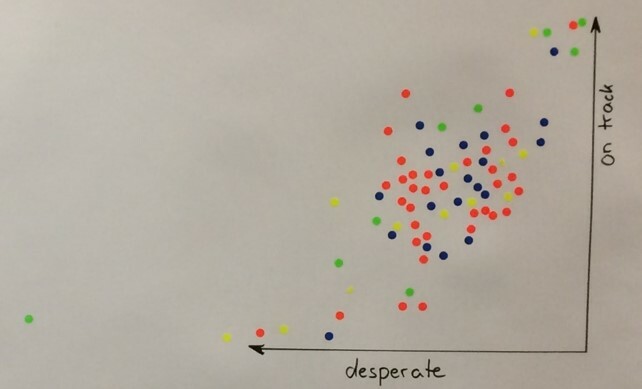 Let’s analyse the data in more detail! 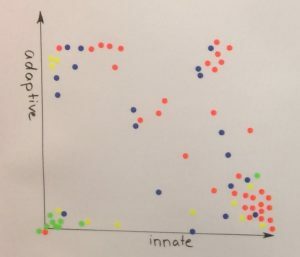 First thing to notice when looking at our adaptive vs. innate immunity graph is the high degree of diversity. While caesar scientists often regard their work neither especially adaptive nor innate (whatever the minus innate green dot might refer to), the UKB researchers seem to come in all varieties ranging from purely innate or adaptive to a mixture of both. The LIMES participants are quite well distributed throughout the graph, too, while the scientists from the other institutes seem to be clustered at times. Analysis of our second graph shows that the diversity continues also in the field of research extending from in silico work to applications in human. In particular participants from the UKB focus on work with cell culture or animals while the caesar has a large proportion of biochemists. I do just hope that those three people who placed their dots between human and animals know what exactly they are working on. My feeling is that our mood-o-meter showed quite a nice Gaussian distribution of the current mental state of our participants with a peak pretty much in the healthy middle. For our outlier on the far left, let’s hope he or she recovered soon after the meeting. In case you are also in need of some stress reduction techniques, just have a look at our recent post. The blog team had a great time at the Cluster Science Days 2016 and we thank all people for participation. We are already looking forward to our next coming together!